According to North Indian calendar, Mauni Amavasya comes in the Magha month and also known as Maghi Amavasya. This Amavasya is also known as Mauna Amavasya and Mauni Amavas. This is a day of spiritual sadhana along with keeping a whole day silence, to help us calm our restless minds. This Amavasya also has a relationship with the Kumbh Mela, being one of its important snan days. 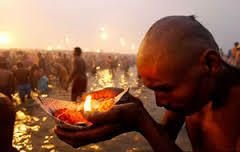 This is important in the annual Magha Mela of the Kalpavasis which views bathing on this day come with lots of spiritual benefits. Silence (Mauna) is one of the most important aspects of spiritual discipline in Hindu mythology. Derived from the word Muni (Saint) who practices silence, it ideally symbolizes a state of oneness with the self. Apart from religious values, Mauni Amavasya is a call of the inner self for initiating an inner ‘dialogue’ with oneself to start one real spiritual journey. This is the day of silence in Hinduism when people take pledge to observe one day fasting by not uttering single word to learn to control the vikshepa, releasing ourselves of distractions to focus within. It is believed that the water of Ganga turns into the nectar on this Amavasya, therefore Mauni Amavasya Snan is the most important day in Hindu calendar to take holy dip. During Kumbh Mela, this one snan is the most important bathing day in Allahabad and known as the day of Amrit Yoga. Many devotees take pledge to take holy dip in Ganga not only on Mauni Amavasya day but also during whole month of Magha. Such ritual starts on Paush Purnima and ends on Magha Purnima. On this day, devotees come in Allahabad and meditate the whole day. Vow of silence is one of the basic spiritual disciplines for the evolution of divine life which will lead to mauna of mind. People bath in Holy Ganga and take pledge to observe one day silence with fast. The 600th Annamacharya Jayanthi celebrations were completed in Rajampet on 22nd May 2008. The Chief Minister of Andhra Pradesh, Dr. Y.S. Rajasekhara Reddy unveiled the 108 feet statue of Sri Thallapaka Annamacharya located on Tirupati-Kadapa bypass road in Rajampet on May 22nd. "Ra" is the agni beejam and "Ma" is the amrita beejam. "Ra" indicates the destroyer of ignorance in humans while "Ma" indicates the praana vaayu being nourished. Hence, the great composer, Thyagaraja Swami, a huge devotee of Lord Ram, often stressed on these beejams in his compositions. The term Ugadi has its origin in the Sanskrit word Yugadi, that means starting of a new Yuga or period. This traditional festival is usually celebrated in the second half of March or in early April. People from all over Karnataka celebrate this festival with much enthusiasm and gaiety.The significance of Ugadi stems from mythological times when Lord Brahma, the creator of the universe, began a series of wonderful creations, including that of the earth and all the life forms that live in it. The festival of Ugadi is celebrated to acknowledge that very day on which Lord Brahma started with the task. Kalashtami, which is also known as Kala Ashtami, is observed every month during Ashtami Tithi of Krishna Paksha. Devotees of Lord Bhairav keep fast and worship Him on all Kalashtami days in the year. A simple survey shows that as many as 90% of the people in the Universe will be under the influence of Kuja Dosha. Every one of us, at one time or the other, will hear about Kuja. The word is more prominently heard when horoscopes of the bride and bridegroom are studied before their marriage. Sankashti Chaturthi or Ganesh Sankatahara Chaturti, is dedicated to Hindu God Ganesh. Sankashti Chaturthi January 2016 date is January 27, Wednesday and the Chandrodaya or Moon rise time is 8:57 PM (IST).